The London Vegetable Garden: Overrun with Runners! They can grow really long according to the variety but harvesting them young, tender and often keeps the plant producing more and for longer. 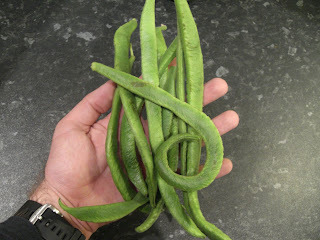 They're very tasty at this length, so will have to keep picking them regularly! Great site. We have recently started growing tomatoes in planters on the kitchen windowsill. They're growing fast and furiously and pretty soon will require propping up. Do we just buy garden cane/bamboo stakes? When we move them out to the tiny balcony should we transplant them to larger tubs?Thank you.